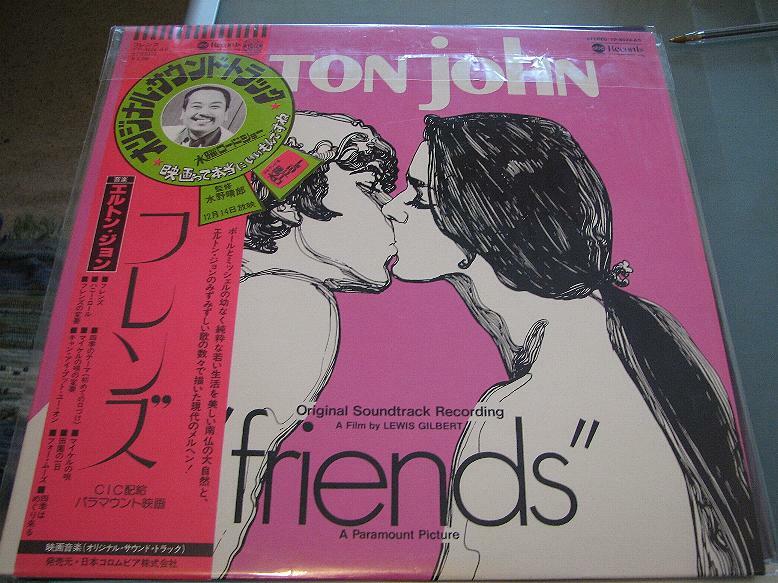 La colonna sonora del film Friends (che doveva intitolarsi "Intimate Games", ma Elton e Bernie si opposero) venne lanciata sul mercato come l'ennesimo nuovo album di Elton John, ma in realtà comprendeva anche composizioni di Paul Buckmaster. L'album infatti è costruito su poche canzoni, di ottimo livello, e sullo score orchestrale che accompagna tutto il film e ciò nonostante entrò nella classifica americana. Buckmaster fu commisionato di ricreare il sound orchestrale dei primi album di Elton, ma essendo a digiuno di colonne sonore venne introdotto da Dudgeon al famoso compositore John Barry, per avere qualche consiglio al riguardo.Da notare la band che registrò le canzoni, con Dee Murray al basso, Nigel Olsson alla batteria e Caleb Quaye alla chitarra, sarebbe diventata la Elton John Band se Caleb Quaye non avesse deciso di proseguire l'avventura con gli Hookfoot. L'album venne pubblicato su etichetta Paramount e non è mai stato distribuito in CD probabilmente per questioni di diritti d'autore, lo si può però trovare inglobato nella raccolta Rare Masters. 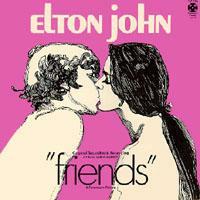 "It's a film soundtrack album which we contracted to do before Elton John was ever released. ...., it represents what we had to write for the film. The whole story behind the film was they contracted us to do three songs. There's two bits in the film where they have a tape recorder sequence for 20 seconds or whatever it was, where everyone's leaping up and down, and a radio sequence for 30 seconds, and they said "You're going to have to write two songs that last for 20 and 30 seconds, and put them on the album." I thought well that's ridiculous. Bernie and I said, "We can't do that," so they said, "We want three songs - the title song". 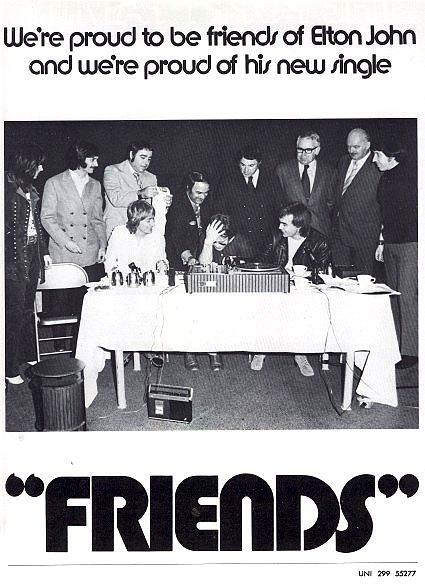 They were going to call the movie The Intimate Game, and Bernie and I said "No, we will not write any songs named for a movie, and we suggested Friends, so we'll settle for Friends." And we had to write another song, which was Michelle's Song. They wanted another song, which was to last a minute and ten. And for film writing, if they want a song that's a minute and ten seconds long, then you're supposed to write a song that's a minute and ten seconds long. You have to time it, and all this rubbish. So we all got together, and we were panicking like mad, and Bernie said write a song that's very short, and we did, and it was a minute and ten seconds long, and I don't know how, by the grace of God, that it was a minute and ten seconds. So that was Seasons. And then they said, "We want a soundtrack album," and I said, "That's awful," because there's very little music in the film. And we said "it's terrible, we've only got three songs." You can't put an album together with all that on. You know, with soundtrack albums, you get bits with motorcars that beep, and horses galloping. So we said, right, we're going to do this thing with the 20 and 30 second songs, then we'll write two songs and re-record the whole album. So we recorded the whole album once for the film, and then went back into our own studio which we always use studio and recorded the whole soundtrack album... so people would at least get a bit of value for their money. They get five songs instead of three and horses galloping. It was recorded and written in four weeks, in between the first song when I came to the States, which was a three-week promotional trip and my first major tour, so it was recorded in between September and October, in September in fact, as a soundtrack album... ah... the record company are promoting it as a new Elton John album, and kids will probably think it is a new Elton John album. .... the guy in London (who's a complete idiot) who runs Paramount Records, said that he said he wanted a really great sleeve. So the people that produced the film and made the film were really great -- it was independently produced film from Paramount -- they said right, and they took the Tumbleweed Connection sleeve up and said to this guy, "Isn't this great? Look, it's got a booklet. We'd like something like this for Friends." And like the guy who designed it, this friend of ours, said yeah, this is a great idea. And the guy said it was rubbish - the worst thing he'd ever seen, and he said "Wait till we come up - we'll come up with something that'll sweep this off the board." And they came up with that strawberry coloured rubbish. I suppose I can't blame the Paramount Record Company for putting my name on it in big letters, cause I would have probably done that... I don't know... I don't want to get into that anyway. It's not an Elton John album, believe me. The album was gold within three weeks, so that's... it's amusing; I'm knocked out, I'm very glad that it is a gold record. 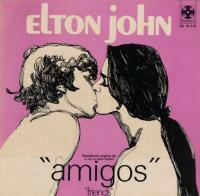 But it's not an Elton John album."